Cherished Treasures: Day 9 Challenge - 3 Projects and More Martha Stewart Love! Day 9 Challenge - 3 Projects and More Martha Stewart Love! I am so behind in sharing my progress with the 20 Day Challenge that was last month. In case you haven't checked out the challenge, you can take part at any time of the year. 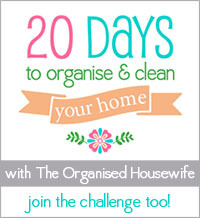 Just think, take 20 days and be committed and the end result will be a clean home! Clean - your ceiling fans. the ladder out and stands on the top step and cleans our ceiling fans. Because I am not coordinated, I don't even try to climb a ladder. So I found the next best thing. The handle extends to 3 feet and made it easy to reach our ceiling fans. and I just love this product. Definitely a great cleaning product! I declutter our serving utensil drawer. fairly easy. I think I have about 10 serving spoons and 5 spatulas and they get tangled up quickly. the left side seemed to be the right spot to hold my spoons. I think I put 3 away in another spot that I keep utensils that are only used one time a year. my way the next day...hehehehe. to help keep me organized. I now love Staples so much, hubby not so much! Here's my newest organization from the Martha Stewart Home Office line. have looked at it so many times that I finally bought it. Even though my craft space/office is mainly pink - this aqua color might be my second favorite color. Staples does sell the binder in the larger size but I really like the smaller binder (5 1/2 X 8 1/2). While the line is kind of expensive, I tried to use a 40% off coupon each time I visited the store. There are so many Martha Stewart items, love the post it note tabs, zippered pouches, labels, and the list can go on and on. You can get the free printable here. Would you believe I have my blog topics picked for the next two weeks? I'm showing you the 3rd week page which is not done yet. Another section holds a calendar with more post it note tabs. and her calendars were all gone so I picked up another brand that fit the binder perfectly. Okay, the labels and tabs are all so cute and I couldn't just pick one or two. believe the same girl checked me out each time! No binder would be complete without paper to jot down those thoughts before they go to la-la land. And I'm also thinking I'll use it to right down errands I need to do because...the memory is a going away whether I like it or not. In the back of the binder are the page protectors that are amazing, there's a flap at the top so that things won't slip out. Some ideas to these protectors would be to hold coupons, pictures, important papers, credit cards, store cards. gift cards or store receipts. I've also seen online that papercrafters are using these page protectors for storing clear stamps - the flap will prevent them from slipping out. If you haven't been to Staples recently, you'll want to stop by and check out the Martha Stewart Home Office line. Make sure to take a coupon with us as most of the time, this line isn't on sale.